After performing a heritage building inventory 1998, the R.M. 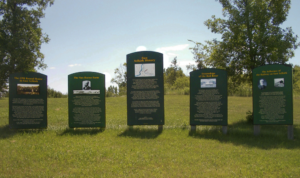 of St. Clements Heritage committee was able to create a list of 177 historically significant sites, following guidelines set out by the Manitoba Historic Branch. 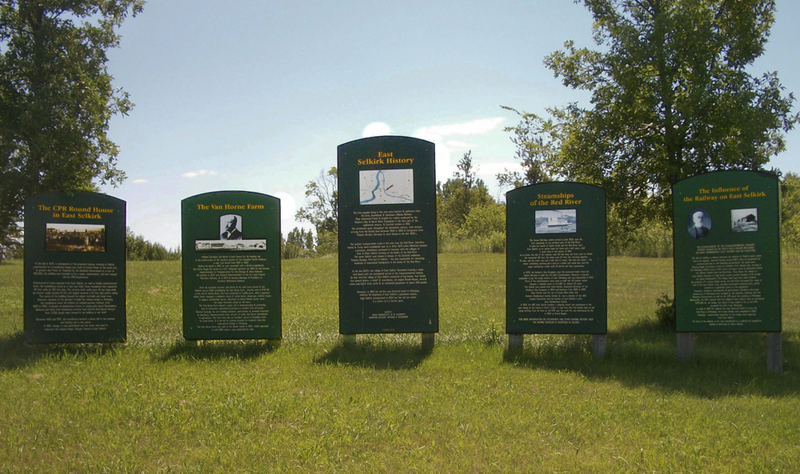 From these, the committee identified a short list of historically-significant sites. Thomas Bunn, farmer and lawyer, represented this district on Louis Riel’s first provisional government and was the Secretary of State of that first government. He was elected to the first Legislative Assembly of Manitoba in 1870 and sat until his death in 1875. He was the clerk of the General Quarterly Court from 1868-72 and was called to the Manitoba Bar in 1871. He established his farm on Lot 97 in 1860 and built his home on the high river bank in 1862 after surviving the 1852 flood in Winnipeg. Samuel Taylor, was the mason who built the 1,120sq.ft stone house, called “Victoria Cottage” after the reigning monarch. Thomas Bunn Jr. carried on his father’s tradition and served on St Clements Council from 1899-1906 and then as Secretary-Treasurer from 1906-1940. In the fall of 1878 in anticipation of the proposed railway crossing at Selkirk, construction on a roundhouse began. The site of the roundhouse was slightly south of Colvile Road at the south end of present day Frank St. The project was financed by the Dominion Government at a cost of $60,000.00 and was intended to be a repair, maintenance, and turn-around site for CPR locomotives. Constructed of stone quarried from East Selkirk as well as locally manufactured brick, the roundhouse stood on a two-foot thick stone foundation that measured 90 ft. wide by 180 ft. long. The exterior brick walls were 18 ft high, while the interior walls reached 15 ft. that angled towards a 30-foot high centre ceiling. In the centre of the building housed the engine turntable and repair area. The building contained a small basement that measured 50 square feet. From 1899-1906, the structure was used as an Immigration Centre to temporarily house new immigrants arriving from Central and Eastern Europe. Over 2000 people were housed in the building at one time and over the next few years immigrants included Doukhabors and Galacians. Between 1906-1916, the roundhouse was used as a dance hall in the summer and skating rink in the winter. In 1899 William Cornelius and Lucy Van Horne established the Van Horne farm directly east of PTH 59 at the end of Colvile Road. Consisting of approximately 4,000 acres, the Van Horne farm included a spacious family home, manager’s residence, horse and cattle barns, sheep pen, chicken coops and a piggery. Clydesdale horses, Shorthorn and Dutch Belted cattle, and pedigree hogs were the major livestock raised on the farm. The farm played a major role in demonstrating and promoting agricultural practices throughout Western Canada. It taught new and innovative agricultural techniques to settlers by offering educational training seminars on site. Farmers could attend ploughing matches performed by the latest modern machinery in addition to handling and examining livestock within the comforts of the Van Horne stables. The farm provided agrarian education to students from the Agricultural College in Winnipeg as well as being a source of excellent breeding stock for local farms. William Cornelius Van Horne began his career as a telegraph operator. In 1862 he became a dispatcher for the Chicago and Alton Railroad. Four years later he was appointed superintendent of Transportation. He was awarded the title of General Superintendent of the St. Louis, Kansas City Northern Railway in1872, and General Manger and President of Southern Minnesota Railway in 1874. Van Horne took charge of the construction of the Canadian Pacific Railroad in December 1881 and was responsible for the western section, which was completed in 1885. Before his death in 1915, he was rewarded with a British knighthood. The Van Horne farm was sold to the Searle family in 1935 who operated it until 1968 when it was subdivided and sold. The Red River was the original transportation route for the early pioneers and when the community of Selkirk was established in the 1850’s, the community naturally formed on both sides of the river, as east and west Selkirk with the river as the major highway. The early aboriginal people of the area were Cree and Assiniboine and by the late 1700s, they were joined by Saulteaux/Ojibway groups as well as French and English fur traders. After1812, Scottish settlers arrived to join the Peguis First Nation band along with numerous Metis families and retired Fur traders who lived in the area. After Manitoba became a province in 1870, many non-Native settlers began purchasing land from Ojibwa and Cree residents. The village of Selkirk formed soon after on both sides of the Red River. The name was chosen in honour of the Scottish nobleman, Thomas Douglas, 5th Earl of Selkirk. He was the man responsible for relocating hundreds of impoverished immigrants to the banks of Red River. From 1850 to1880 farmers from the British Isles became part of the community. In the late 1890’s immigrants came from various parts of Central and Eastern Europe, referred to as Galicians. They originated from Poland, Ukraine, Germany and west Russia. These new Canadians were primarily farmers and settled in agricultural community of St Clements Municipality with the village of East Selkirk as the trade center. In these early years the village of East Selkirk flourished, as there was a major land boom with the anticipated arrival of the transcontinental railway. At that time the village of East Selkirk consisted of log homes, four hotels, five general stores, a wharf and warehouse, a rail engine Round House, several stone quarries and brickyards and an estimated population of about 400 people. However in 1881 the rail line was diverted south to Winnipeg and the population started to decline. East Selkirk incorporated in 1883. The Anson Northup was the first steamship to arrive on the Red River of the North in June 1859. It used the mouth of Cooks Creek and the Red River near East Selkirk for its winter base. The hull of the steamer was 90 ft long but from stem to wheel she measured 100 feet. Her beam was 24 ft and her carrying capacity was 75 tons. She drew two and a half feet of water and had two decks. The first deck contained the working parts such as the boiler and wood box; the second deck had a cabin with 24 berths in addition to 4 staterooms. The steamer docked at the mouth of Cook’s Creek for three years until it sank at that location in the winter of 1861/62. In 1870, the Hudson’s Bay Company built the SS Chief Commissioner using the recovered boiler from the Anson Northup. It proved unsuitable to ply the rough waters of Lake Winnipeg and was consequently dismantled in 1875. Parts of the Commissioner were used to build the SS Colvile. The Colvile was a valuable asset to the HBC for almost twenty years. In 1881 the HBC built Colvile Landing, a shipping wharf and warehouse in the east slough at the mouth of Cook’s Creek where the Colvile took on cargo from rail cars arriving from the east on the CPR spur line.The Colvile was destroyed by fire in 1894 at Grand Rapids. The name Colvile derived from Eden Colvile, Associate Governor of the Hudson’s Bay Company in 1850 and Governor from 1880-1889. Eden Colvile descended from Louisa Mary Eden & Andrew Wedderburn Colvile. Colvile Sr. was a member of the HBC London Committee and the brother of Lord Selkirk’s wife Jean Wedderburn Colvile. For more information on steamships and other marine history visit the Marine Museum of Manitoba in Selkirk. The establishment of the transcontinental railway across Canada in the 1880’s had a major influence on many communities and East Selkirk was no exception. Scottish-born Sandford Fleming was employed by the Canadian Pacific Railway to survey a route for Canada’s first transcontinental railway line. In 1872 Fleming arrived in the Selkirk area with a surveyor crew. They determined the railway should cross the Red River at a point where the banks were high, thus preventing damage to the bridge by spring floodwaters. The village of Selkirk had high banks, had never flooded and therefore it was considered a good spot to cross. Residents, businessman, and government officials in the larger community of Winnipeg were enraged by the CPR’s decision to cross the Red River at Selkirk. They pressured the Dominion Government as well as the CPR to place the crossing at Winnipeg. The CPR estimated that it would cost $125,000 to build the Selkirk Bridge but the village of Selkirk failed to raise the required funds. Consequently, the CPR accepted the deal offered to them from Winnipeg. In June 1881 the railway line was diverted south to cross the Red River in Winnipeg. The Louise Bridge was completed in 1882 with construction materials quarried from East Selkirk. The prospect of a future bridge across the Red River increased the value of land in the East Selkirk area. Numerous lots were purchased by outsiders, which boosted the population significantly. However, after the CPR diverted their railway to Winnipeg, the population of East and West Selkirk declined. Crossing of the Red River at that time was by a Ferry located at the end of McLean avenue and continued in operation until 1937 when the current Selkirk bridge was completed. 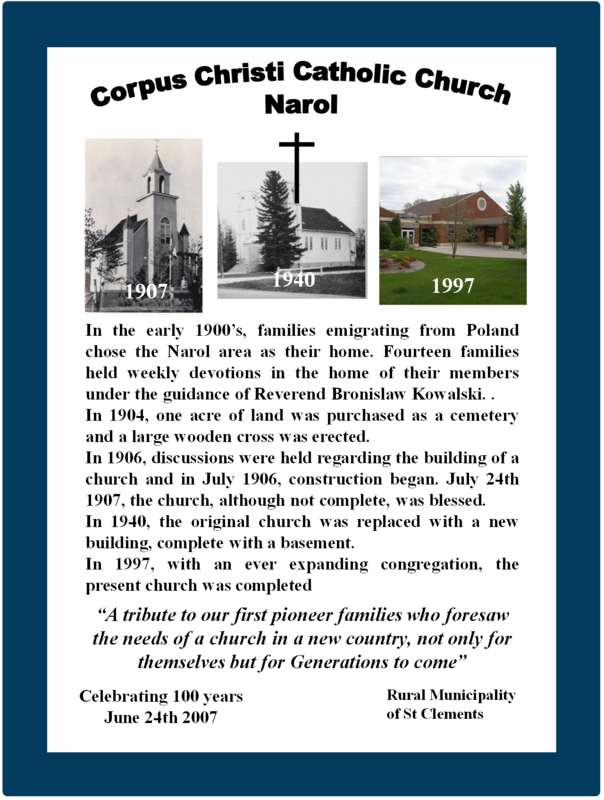 In the early 1900’s, families emigrating from Poland chose the Narol area as their home. Fourteen families held weekly devotions in the home of their members under the guidance of Reverend Bronislaw Kowalski. In 1904, one acre of land was purchased as a cemetery and a large wooden cross was erected. In 1906, discussions were held regarding the building of a church and in July 1906, construction began. July 24th 1907, the church, although not complete, was blessed. In 1940, the original church was replaced with a new building, complete with a basement. In 1997, with an ever expanding congregation, the present church was completed. 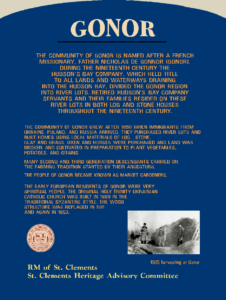 The community of Gonor is named after a French Missionary, Father Nicholas de Gonnor (Gonor). During the nineteenth century the Hudson’s Bay Company, which held title to all lands and waterways draining into the Hudson Bay, divided the Gonor region into river lots. Retired Hudson’s Bay Company servants and their families resided on these river lots in both log and stone houses throughout the nineteenth century. 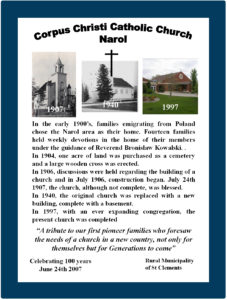 The community of Gonor grew after 1890 when immigrants from Ukraine, Poland and Russia arrived. They purchased river lots and built homes using local materials of log, stone, clay and grass. Oxen and horses were purchased and land was broken and cultivated in preparation to plant vegetables, potatoes and grains. Many second and third generation descendants carried on the farming tradition started by their ancestors.The people of Gonor became known as market gardeners. The early European residents of Gonor were very spiritual people. The original Holy Trinity Ukrainian Catholic Church was built in 1899 in the traditional Byzantine style. The wood structure was replaced in 1911 and again in 1952. “Aboriginal people camped near the rapids above this site for at least 30 centuries before European settlers arrived, following the 1821 amalgamation of the two big fur trade companies. The redundant fur trade employees moved to the Red River Settlement, where they either purchased or were granted two mile long plots, ranging from 188-330 feet in width. This river lot system, adapted from Eastern Canada, provided equitable distribution of hay and wood resources while the river provided transportation. 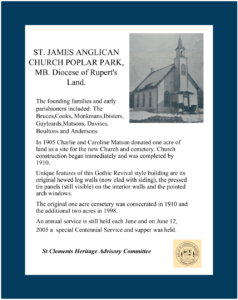 Many English-speaking retired fur traders brought their native families to settle in St. Andrews parish, where an Anglican mission was established in 1830. The 1835 census showed about 70 families living along this stretch of the river. Most settlers only had a few acres under cultivation, supplementing their incomes with fishing, buffalo hunting and HBC contract work. Under the terms or the Manitoba Act, 1870, most of these families were able to successfully establish title to their river lot farms. 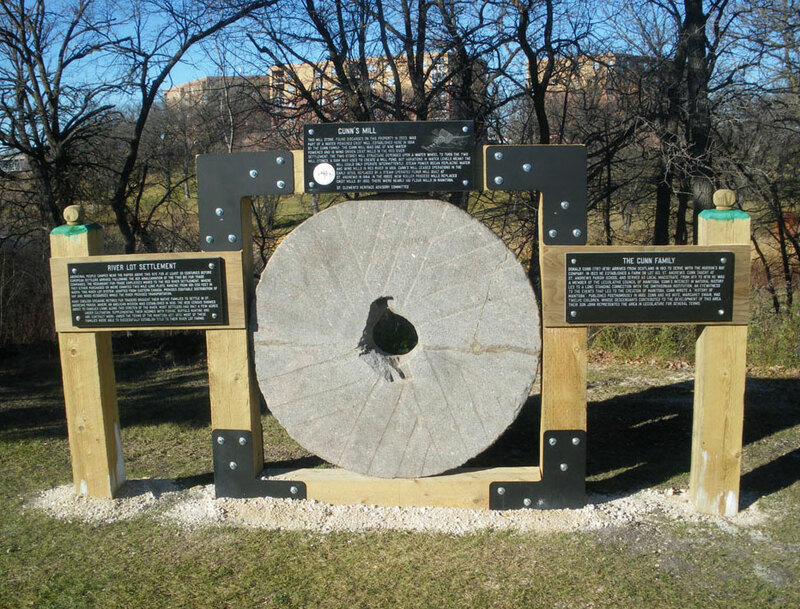 This mill stone, found discarded on this property in 2003, was part of a water-powered grist mill established here in 1854 by the Gunn family. 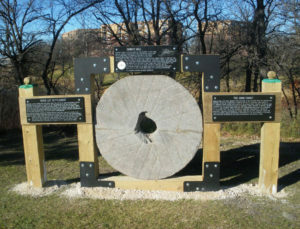 The Gunn Mill was one of nine water-powered and 18 wind-driven grist mills in the Red River Settlement. The two-storey mill structure depended upon a water wheel to turn the two mill stones. A dam was used to create a mill pond, but variations in water levels meant the mill could only operate intermittently. Steam power began replacing water and wind mills in Red River in 1856. Gunn’s mill ceased operations in the early 1870’s, replaced by a steam-operated flour mill built at St. Andrews in 1864. In the 1880’s, new roller process flour mills replaced grist mills. By 1900, there were nearly 100 four mills in Manitoba. Donald Gunn (1797-1878) arrived from Scotland in 1813 to serve with the Hudson’s Bay Company. In 1823, he established a farm on lot 163, St. Andrews. Gunn taught at St. Andrew’s parish school and served as local magistrate. 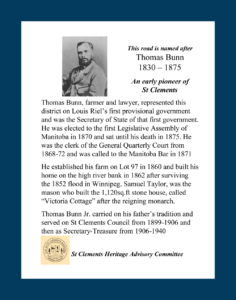 From 1871 to 1876 he was a member of the Legislative Council of Manitoba. Gunn’s interest in natural history led to a long-standing connection with the Smithsonian Institution. An eyewitness to the events that led to the creation of Manitoba, Gunn wrote a ”History of Manitoba”, published posthumously in 1880. Gunn and his wife, Margaret Swain, had twelve children, whose descendants contributed to the development of this area. Their son John represented the area in Legislature for several terms. East Selkirk School District 99 began in 1884 with a one room log school building. This school district dissolved in 1908 when lawyer Alexander Butler Rowley resolved the differences between opposing community groups. 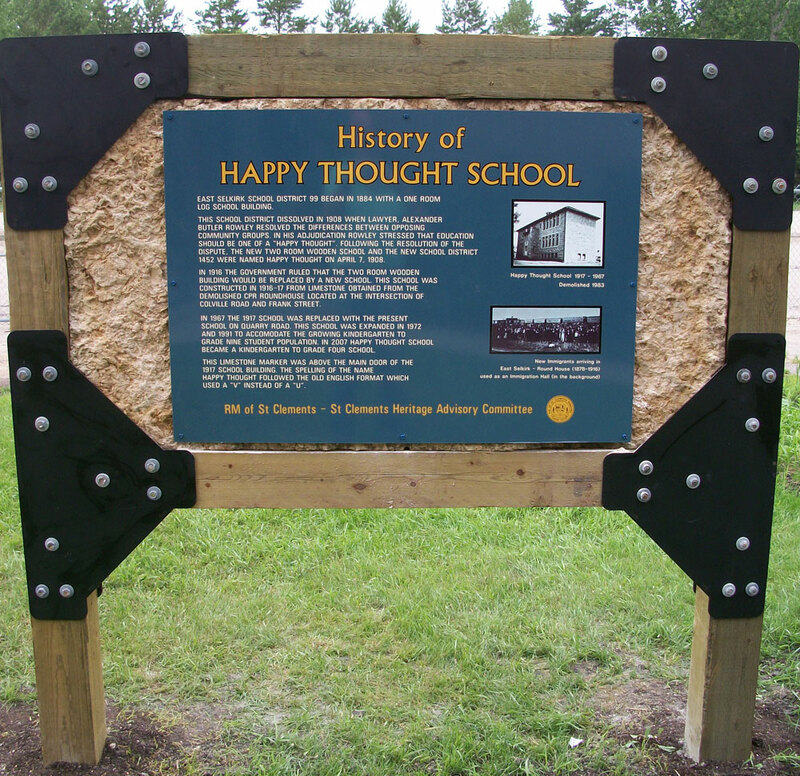 In his adjudication Rowley stressed that education should be one of a “happy thought”. 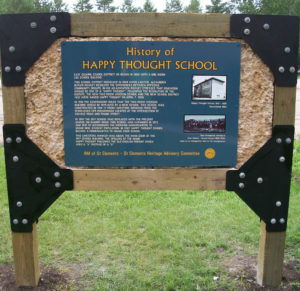 Following the resolution of the dispute, the new two room wooden school and the new school district 1452 were name Happy Thought on April 7, 1908. In 1916 the government ruled that the two room wooden building would be replaced by a new school. This school was constructed in 1916-17 from limestone obtained from the demolished CPR Roundhouse located at the intersection of Colville Road and Frank Street. [Click to enlarge]school was expanded in 1972 and 1991 to accommodate the growing Kindergarten to grade nine student population. 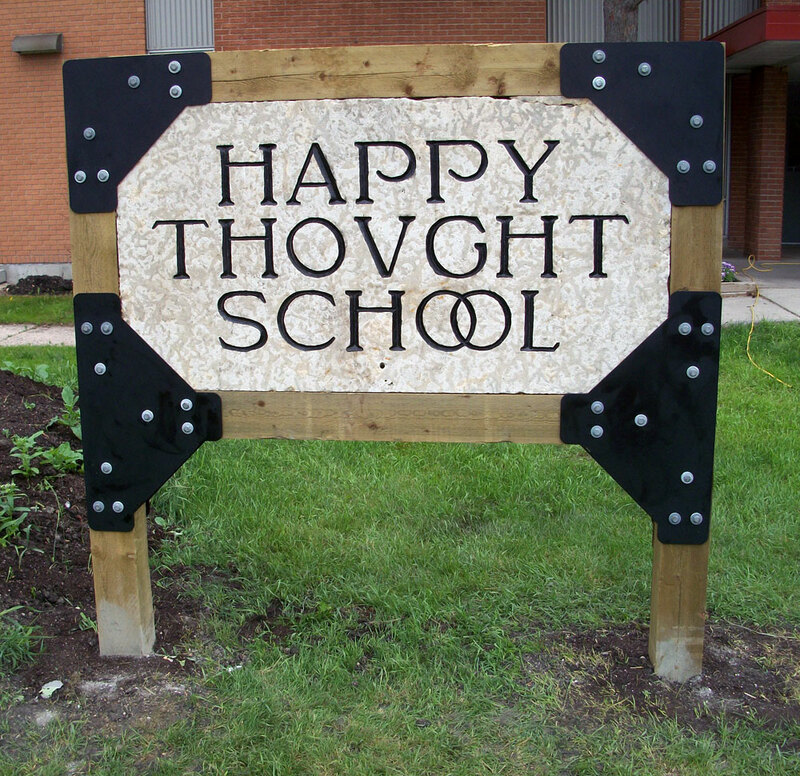 In 2007 Happy Thought School became a Kindergarten to grade 4 school. This limestone marker was above the main door of the 1917 school building. 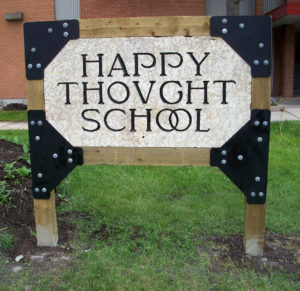 The spelling of the name Happy Thought followed the old English format which used a ‘V’ instead of a ‘U’. 1897: The first Polish immigrants came through the Immigration Hall in East Selkirk from south eastern Poland, a region known as Galicia. For the first decade or more, they attended St. Michael’s Church in Cooks Creek or held their own services in private homes. 1912: A chapel was erected under the guidance of Fr. Andrew Stojar OMI and named after St. Stanislaus Kostka, a Polish saint. 1924: Fr. Antione D’Eschambault, a Diocesan priest from St. Boniface Diocese was appointed to serve East Selkirk. He came from St. Boniface on a regular basis to say mass, eventually the parish was turned over to the Polish oblate of Mary Immaculate (OMI). 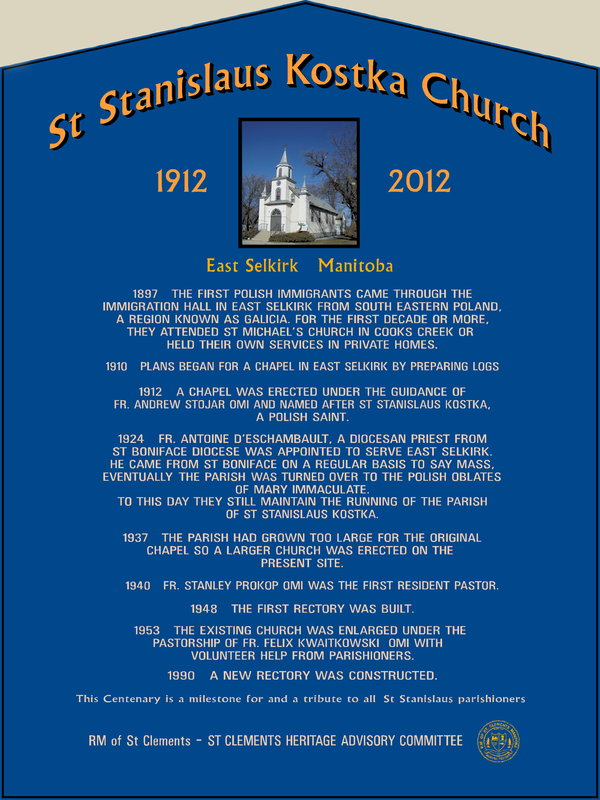 To this day they still maintain the running of the parish of St. Stanislaus Kostka. 1937: The parish had grown too large for the original chapel so a larger church was erected on the present site. 1940: Fr. Stanley Prokop OMI was the first resident pastor. 1948: The first rectory was built. 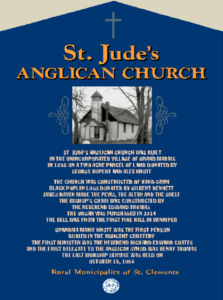 1953: The existing church was enlarged under the pastorship of Fr. Felix Kwaitkowski OMI with volunteer help from parishioners. 1990: A new rectory was constructed. 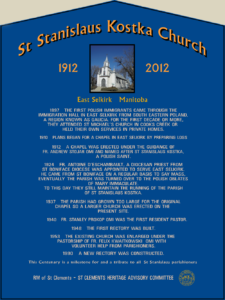 This Centenary is a milestone for and a tribute to all St. Stanislaus parishioners. In 1905 Charlie and Caroline Matson donated one acre of land as a site for the new Church and cemetery. Church construction began immediately and was completed by 1910. Unique features of this Gothic Revival style building are its original hewed log walls (now clad with siding), the pressed tin panels (still visible) on the interior walls and the pointed arch windows. The original one acre cemetery was consecrated in 1910 and the additional two acres in 1998. An annual service is still held each June and on June 12, 2005 a special Centennial Service and supper was held. 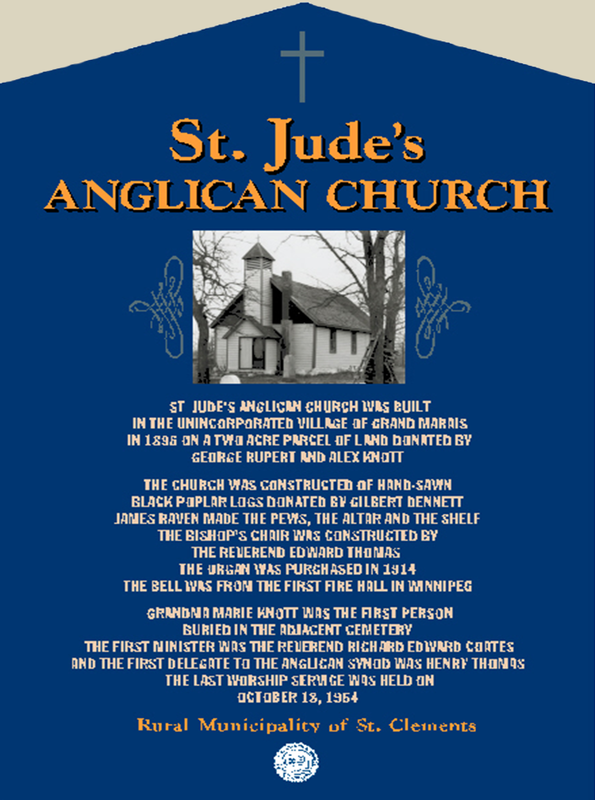 St Jude’s Anglican Church was built in the unincorporated village of Grand Marais in 1896 on a two acre parcel of land donated by George Rupert and Alex Knott. The church was constructed of hand-sawn black polar logs, the altar and the shelf.The Bishop’s chair was constructed by the Reverend Edward Thomas. The organ was purchased in 1914. The bell was from the first fire hall in Winnipeg. Grandma Marie Knott was the first person buried in the adjacent cemetery. The first minister was the Reverend Richard Edward Coates and the first delegate to the Anglican Synod was Henry Thomas. The last worship service was held on October 18, 1964. 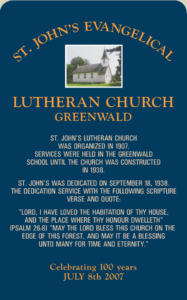 St. John’s Lutheran Church was organized in 1907. 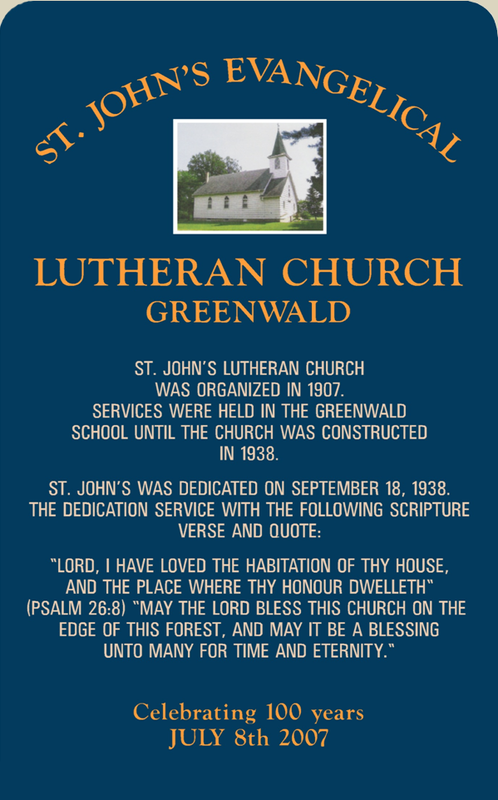 Services were held in the Greenwald School until the church was constructed in 1938. 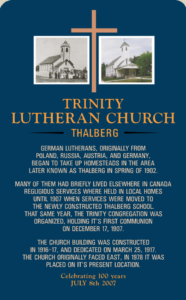 German Lutherans, originally from Poland, Russia, Austria and Germany, began to take up homesteads in the area later known as Thalberg in spring of 1902. Many of them had briefly lived elsewhere is Canada. 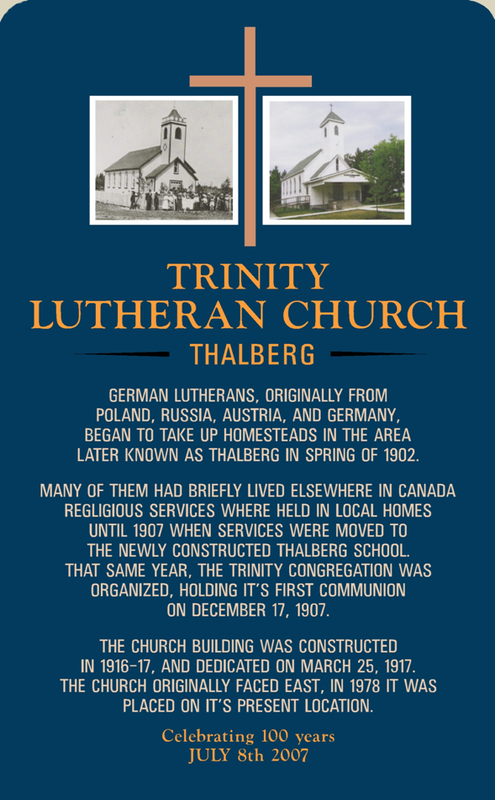 Religious services were held in local homes until 1907 when services were moved to the newly constructed Thalberg School. That same year, the Trinity Congregation was organized, holding its first communion on December 17, 1907. The church building was constructed in 1916-17, and dedicated on March 25, 1917. The church originally faced east; in 1978 it was placed on its present location. 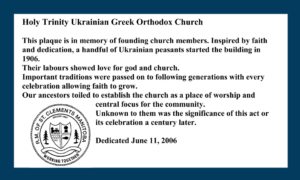 General Information: Holy Trinity Ukrainian Greek Orthodox Church is located in the district of Poplar Park. In 1905 two acres of land for the church and cemetery were purchased from Mr. Klym Weremy at a cost of $35.00. The church was built of logs in 1907 and in 1911 the Building Committee finished the interior and exterior. The first church bell was bought in 1913. In 1927 the church was remodeled and extended from the east and turned half-way around with the entrance door facing west. The graveyard of the church contains approximately 150 grave markers, mostly of Ukrainian heritage. There are two unique features to the design of the Orthodox Church, the first being the Orthodox cross. This cross, also known as the Crux Orthodoxa, has two additional bars near the top and bottom of the traditional cross. The top bar represents the sign which was posted on top of Jesus’ cross titled “INRI” (“Jesus of Nazareth, King of the Jews”), the mocking title bestowed on Christ by the Romans in the New Testament account of the crucifixion. Although the lower bar is said to have multiple meanings, the most common representation concerns the two thieves who were crucified with Jesus. One thief repented and rose to heaven (depicted by the left side) and the other did not regret his sin and went to hell (depicted on right). This plaque is in memory of founding church members. 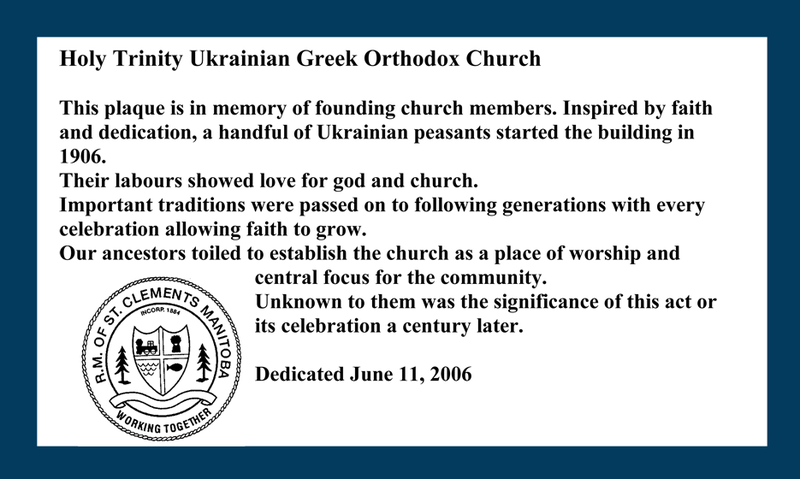 Inspired by faith and dedication, a handful of Ukrainian peasants started the building in 1906. Their labours showed love for god and church. Important traditions were passed on to following generations with every celebration allowing faith to grow. Our ancestors toiled to establish the church as a place of worship and central focus for the community. Posted in Heritage Sites, Historic Sites & Activities.